Want an indulgent treat that won't blow up your diet? It turns out chocolate might be the ultimate cheat food for building a better body. But, plowing through a bag of sugar-coated chocolate candies won't do your health or waistline any favors. Instead, here are three healthy, antioxidant-rich ways to get your chocolate fix—and a recipe to put each one to deliciously good use. Chocolate bars are essentially a blend of ground up cocoa bean (referred to as chocolate liquor or cocoa mass), cocoa butter, and sugar. The higher the cocoa percentage of a bar, the less sugar and generally the larger dose of antioxidants it will contain. Since many antioxidants have a bitter taste, dark chocolate can be an acquired taste. While dark chocolate contains a fair amount of saturated fat, the majority of this comes in the form of stearic acid, which appears to have a neutral impact on heart health. Even with all the health benefits dark chocolate provides, you still need to practice portion control. A good rule of thumb is to snack on about 1 ounce daily, equal to 140-170 calories. Cocoa powder is made when fatty cocoa butter is pressed out of cocoa beans, leaving behind a cakey substance that is then dried and pulverized into cocoa powder. Not only does this remove much of the fatty calories, it also concentrates the flavor as well nutrients and antioxidants. And unlike chocolate bars, low-calorie cocoa powder won't increase the amount of added sugar in your diet. Use cocoa powder to add chocolate essence to oatmeal, protein shakes, pancake or waffle batter, and, of course, any number of baked goods. You can also add it to homemade energy foods like bars and balls, and to chili to deepen its flavor. Take raw or roasted whole cacao beans, smash them to bits, and you end up with crunchy, intensely flavored cacao nibs. (Nibs are commonly referred to "cacao nibs" rather than "cocoa nibs.") Think of these nibs as chocolate in its most rudimentary form—kind of like Mother Nature's chocolate chips. The least processed form of chocolate, nibs are made of 100-percent cacao. This pure form retains a treasure trove of nutrition, including significant amounts of dietary fiber (up to 8 grams in a 1-ounce serving), antioxidants, and magnesium. They also contain caffeine, so don't eat them late at night. 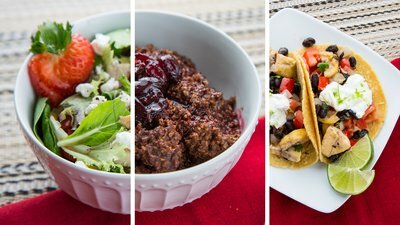 Sprinkle cacao nibs on oatmeal, yogurt, cottage cheese, fruit salads, smoothie bowls, and ice-cream. They're also a surprisingly great addition to green salads. Or add them to muffin or pancake batter for a bit of crunch. You can even grind them with coffee beans to perk up your java. *Chocolate is not a substitute for medical prescriptions and should not be treated as such. Chocolate infused oatmeal. Can there be any better way to start the day? Soak the oats overnight to cut down on their cooking time. You can also prepare the cherry sauce in advance and heat it up again at breakfast. If you want to bump up the protein numbers, stir some protein powder into the oats as you heat them up on the stovetop. With the stealth addition of cocoa and chipotle chili, this bean filling is so rich and smoky tasting that you won't miss the meat on taco night. Meaty chicken, sweet strawberries, velvety goat cheese—teamed up with the bitter crunch of cacao nibs to deliver a festival of flavors and textures. Gently poaching the chicken in water keeps the meat deliciously moist. Lin, X., Zhang, I., Li, A., Manson, J. E., Sesso, H. D., Wang, L., & Liu, S. (2016). Cocoa flavanol intake and biomarkers for cardiometabolic health: a systematic review and meta-analysis of randomized controlled trials. The Journal of Nutrition, 146(11), 2325-2333. Rowley IV, T. J., Bitner, B. F., Ray, J. D., Lathen, D. R., Smithson, A. T., Dallon, B. W., ... & Goodrich, K. M. (2017). Monomeric cocoa catechins enhance β-cell function by increasing mitochondrial respiration. The Journal of Nutritional Biochemistry, 49, 30-41. Patel, R. K., Brouner, J., & Spendiff, O. (2015). Dark chocolate supplementation reduces the oxygen cost of moderate intensity cycling. Journal of the International Society of Sports Nutrition, 12(1), 47. Payne, M. J., Hurst, W. J., Miller, K. B., Rank, C., & Stuart, D. A. (2010). Impact of fermentation, drying, roasting, and Dutch processing on epicatechin and catechin content of cacao beans and cocoa ingredients. Journal of Agricultural and Food Chemistry, 58(19), 10518-10527. Miller, K. B., Hurst, W. J., Payne, M. J., Stuart, D. A., Apgar, J., Sweigart, D. S., & Ou, B. (2008). Impact of alkalization on the antioxidant and flavanol content of commercial cocoa powders. Journal of Agricultural and Food Chemistry, 56(18), 8527-8533.